The Model 7005 Piezoelectric Accelerometer is an excellent choice for general-purpose shock and vibration measurement work, and is especially well suited for testing of small specimens. It is designed for the measurement of medium frequency, moderate to high-level shock and vibration. The Model 7005 incorporates a ring-shear crystal mass assembly within a stainless steel body to provide an extremely reliable sensor that is insensitive to environmental inputs such as base bending and thermal transients. The isolated case construction provides exceptional electrical isolation which yields accurate, wideband shock and vibration data. This unit is supplied with Columbia's exclusive micro-miniature detachable cable and connector assembly. 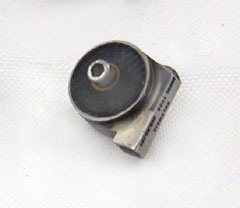 Mounting is accomplished with a single center 2-56 mounting screw.